Other than the attachment of Serbia to the place- there was an Albanian element in the conflict as well that added to the geopolitical tension at the time, as there were fears Albania would seek to integrate Kosovo into a Greater Albania. That hasn't happened, as Kosovo remained under UN Administration until 2006 when final status negotiations of the country began- which lead to it's independence in 2008. Which brings us to their flag! Adopted on February 17, 2008, the flag is unusual in that it's the only country other than Cyprus to use a map as the main design element. 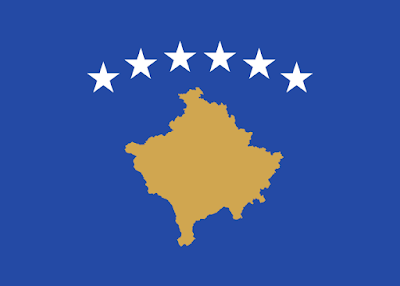 The six white stars above the map of the country represent (officially) the six major ethnic groups of Kosovo: Albanians, Serbs, Turks, Gorani, Romani and Bosniaks. (Unofficially, the stars are meant to represent the six regions of the country as well.) The meaning behind the colors of the flag have yet to be defined but the overall design of the flag is similar to that of Bosnia and Herzegovina. There's really not much more to it than that... I wish the colors did have meaning behind them, but I'm sure they'll get around to it at some point- at least I hope so. One more fun fact above Kosovo: they name streets after President Bill Clinton there. Oh, he also has a statute. So there you have it- the flag of Kosovo! Remember, until next time keep your flags flying- FREAK or otherwise! *I also need to read this book as well. Kaplan references it a ton in his book and I've never gotten around to reading it.